Magnetic key rack made of solid brushed stainless steel (1,5 mm thick). The usable surface is 32 x 3,5 cm. There are 6 powerful magnets on the back side (see photos), so your keys "magically" stick to the key rack. Modern keys are not magnetic, but mailbox keys or your key ring is magnetic enough so that the entire key ring "sticks". Simple and elegant. 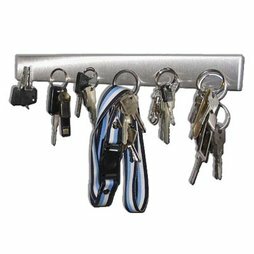 The stainless steel key rack can be mounted without any visible screws with the help of the magnetic wall pins (included). The super magnets are glued to the backside of the plate. The small key rack has 6 magnets on the back. This means you have 6 magnetic "docks". 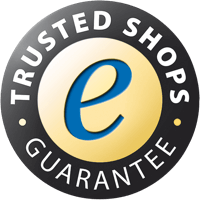 The stainless steel key rack is magnetically attached to the magnetic wall pin. The Key rack is placed on the magnetic wall pins.